The 35m span will carry pedestrians over the River Thames from Glen Island to Ray Mill Island, linking the new Taplow Riverside mixed-use development with Maidenhead in the UK. The bridge was designed by Knight Architects and engineers Cowi for Berkeley Homes (Oxford and Chiltern). This regeneration scheme is intended to transform the waterfront, and the sensitive and elegant design of the new footbridge provides the quality and appearance required to protect and enhance the character of the two riverside conservation areas. The shallow arch form of the design is inspired by Isambard Kingdom Brunel’s nearby Maidenhead Bridge, which iis echoed in the slender new steel structure. It provides the site with a modest riverside landmark which is conceived as a destination for pedestrians as well as a cross-river connection. The fabricated triangular-section steel arches form a simple and elegant composition of deck and twin structural arches. Slender steel plate hangers emphasise its composition and ensure the structure is lightweight and transparent in long river views. Fabrication of the bridge sections was carried out by SH Structures. Martin Knight, director of Knight Architects, said: "The new Thames bridge at Taplow has been eagerly anticipated by the local community on both sides of the river for several years, so it is wonderful to see it open and in public use. The design is inspired by its setting, including Brunel’s famous Maidenhead Railway Bridge, and the bridge highlights the wider transformation of the entire site from an unloved post-industrial mess to a beautiful new development. 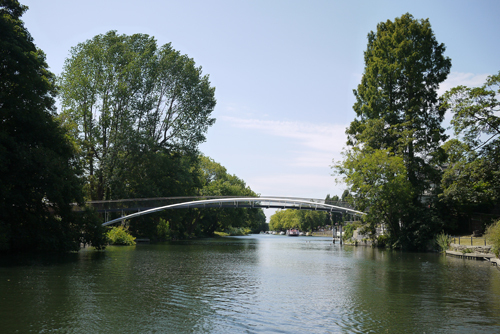 Bridges are strongly associated with a sense of place and our new footbridge already feels like a natural part of the new identity of Taplow Riverside." Cowi lead designer, Ian Firth, said that he was delighted with the outcome. "The slenderness and transparency of the elegant structure has been a primary objective throughout. We were able to stabilise the arches using the steel hangers and thereby trim the size of the triangular section down to a minimum." The design also allowed the entire bridge to be assembled and erected as a single piece using a floating pontoon.